1860-09-10 NRC operates special train for His Royal Majesty, Albert, Prince of Wales Walker-1953, pp. 8 & 52 . 1870c NRC constructs extension to to combination station, condition listed as "Good" ca. 1907 GTR.ND.1907, p. 154 The ca. 1907 GTR inventory gives the size as 30'-4"×118'-0 but the ca. 1869 NRC drawing shows an overall length of approximately. The station is similar in design to the T.S. & M.Jct.Ry. station at Washago and NER station at Severn..
288 ft2 "platform" GTR.ND.1907, p. 154 . 1964-04-26 Appears in C.N.Rys. PTT CNR.A.195, Table 55 . You are to remove the station building from the Railway's lands on or before 30 November 1964. You will fill the basement or cellar if any, of the said facility to the level of the surrounding land and leave the site in a neat and tidy condition, free from debris of any kind. You hereby release and agree to indemnify and save harmless the Railway from and against all loss, injury, damages, compensation (including awards made by any Workmen's Compensation Board), expenses, charges and costs whatsoever which the Railway may suffer or incur, whether in respect to injury to the public or to the employees of the Railway or your Contractor or any subcontractor, or of damage to the property of the Railway, your Contractor or others, or in respect to any infringement of any rights, privileges or easement, by reason of or attributable to this contract or its performance. You will pay the full amount of the consideration, namely, $25.00 (plus 3% Ontario Sales Tax) before any work of demolition or removal is commenced. Your deposit of $10.00 will be returned to you as sonn as the structure has been removed and the site cleaned up to the satisfaction of the Railway. 1964-09-29 Mrs. Fern Todd pays $26.00 to purchase Gilford station. 1964-10-25 Does not appear in CNR PTT CNR.A.196, Table 60 . 1965-01-05 Contract and sales order for purchase of Gilford station. 1976-09-22 Based on Ministry of Transport and Communications, Permit No. D 890, station moved to Simcoe County Museum Robert Price—correspondence . Bill Blain collection Flag stop station (left) and freight house (right) looking south from Concession 15/Main Street. 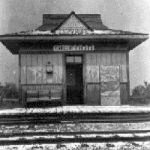 Bill Blain collection East (track) elevation of flag stop station after hail storm. Elizabeth A. Willmot photo Flag stop station. Simcoe County Museum website Station. n.d. NAC / Col. RG30M Acc. 945103 Box 8 Station yard. Plan. 1869-10 NAC/NMC 96684 NRC Combination station. Extension. Plan. Track and end elevations. Sections.